Best For Customers with good credit who are looking to finance life events such as purchases, renovations, or consolidate debt. Darien Rowayton Bank-better known as DRB is a commercial bank that was founded in 2006. DRB originally operated in Darien and Rowayton, Connecticut, but certain operations have reached the national stage as technological advances enabled them to expand their reach. Today, DRB offers a wide range of services for commercial banking, as well as loan services for consumers with different needs. The company offers several different credit products, including personal loans, student loans, and consolidation services for students. Today, the bank’s customer-first approach has made them a mainstay in Connecticut banking, and has let them become a major player in offering quality loans with low rates to students and recent graduates. Their low rates and flexible plans also made them incredibly popular with younger customers who are looking to get ahead or embark on major life projects, and require a little assistance to do so. Getting started with a DRB personal loan application is an easy and straight-forward process. The company understands that creating unnecessary barriers for accessing the funds you need is counter to both your goals and theirs. Therefore, the company’s simple three-step solution makes excellent sense when applying for a loan. The first thing DRB will ask is that you complete a quick form that takes less than five minutes. After you’ve completed this initial form, you’ll be able to choose the right loan term for your circumstances while viewing the applicable interest rates available at your credit level. Once that is completed, you’ll be asked to upload your required documentation, complete the underwriting forms, before receiving your funds in no time. While getting a loan from DRB is a simple process, they do have some requirements when it comes to approving your loan application. However, the company’s standards are not invasive, and we were happy to see that they do not ask you for any sensitive personal information. While eventually you will have to share details about your banking arrangements and financial history, the initial application only asks for relevant details. The company notes on their site you must meet their underwriting criteria to get approved, which include employment history, debt-to-income, disposable income, and credit history factors. However, they do not list specific criteria, so we could not report on it. Nevertheless, we were very happy to see that their conditions are generally friendly, although they are geared toward customers with higher credit scores. During our research, we found that while the company’s loan terms are generally favorable for customers, their range of loan amounts could be improved to a degree. 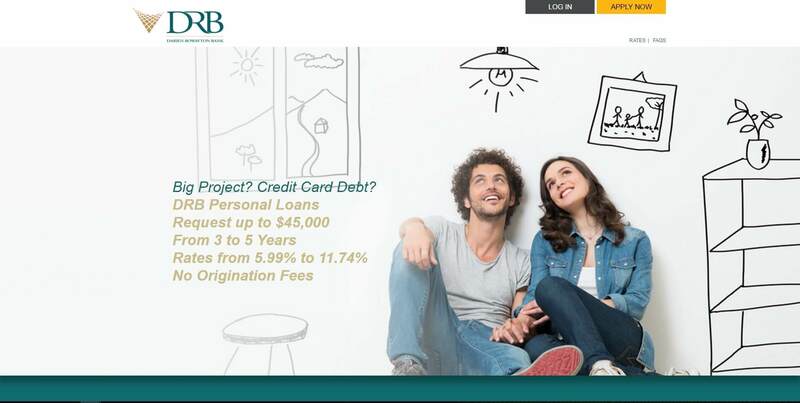 DRB offers personal loans ranging between $1,000 and $45,000. The company does place some limits on how much you can borrow depending on the purpose of your loan. For example, loans to cover moving expenses, auto purchase, or for businesses are capped at $35,000, while larger loans are reserved for major purchases, home improvements, and debt consolidation. Moreover, if you need a loan larger than $35,000, you might be asked to provide further documentation. A characteristic that impressed us was DRB’s transparency when it comes to fees and prices. The company does not charge you any fees for your personal loan, including any origination fees. We were also happy to see that DRB is more than happy to help you lower your interest rates by doing simple things such as setting up automated payments. Something else we really liked was DRB’s referral program, which can net you actual rewards if someone you refer applies for a personal loan with the bank. DRB will reward you with $300 for every new customer you refer, and best of all, there’s no limit to how many times you can benefit from sending new borrowers in their direction. All in all, we were very pleased with DRB’s personal loan application process, which is easy and painless. Despite being a bank, DRB maintains the flexibility and accessibility of a smaller personal lender, meaning that your level of service will always be personal and prompt. While there were some minor shortcomings when it comes to specific details, we were happy to see that DRB is committed to keeping their loans accessible and easy to obtain. 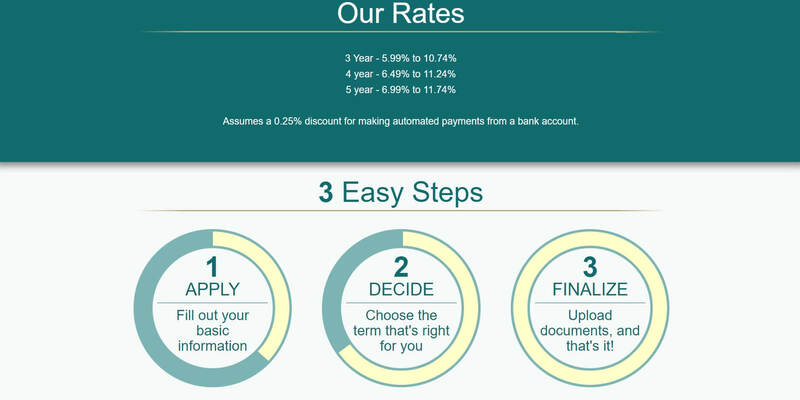 One item that impressed us was that DRB can cut your interest rates if you are signed up for automatic payments directly from a bank account. We would have liked to see more information about the lengths DRB goes to protect your personal information from prying eyes. However, we were very happy to see that the bank itself respects your privacy, and they do not require any sensitive personal information until the later stages of the application process. Even then, the majority of information they request from you is purely financial. When you first apply, DRB simply requires personal contact details, along with other identifying information such as the last four digits of your social security number and similar details. Even afterwards, the documentation DRB requires is very minimal, and a welcome change from some industry standards that require extensive checks. If you’re interested in a personal lender that also gives you a physical location in case you need help or support, DRB’s brick and mortar branches are a great way to get your questions and doubts answered easily. If you cannot find a DRB branch close by, or if you prefer to access support directly from your home, DRB can also be reached by e-mail and telephone. We were delighted by the quality of service we were given in all forms of communication thanks to knowledgeable representatives and helpful customer support staff. We would have liked to see more information regarding the underwriting criteria for approval. There was not a lot of information regarding the minimum credit score requirements. We appreciate more educational resources when it comes to learning about personal loans and finances. The company’s referral program is a great way to give back to its most valued customers. DRB’s low interest rates are amongst the best available in the industry. They offer in-person customer support at any of their branch locations. Their application process is simple and removes a lot of the bells and whistles some competitors include. Even though we saw some minor shortcomings when it comes to providing customers with all the information they need, DRB managed to surprise us with its impressive offerings. The company has placed great emphasis on delivering the best possible service both in-person and virtually, and it shows when you interact with their representatives. The company’s loan terms and loan rates are some of the best in the industry, and though their loan amounts might be lower than some competitors, their overall service more than makes up for it. 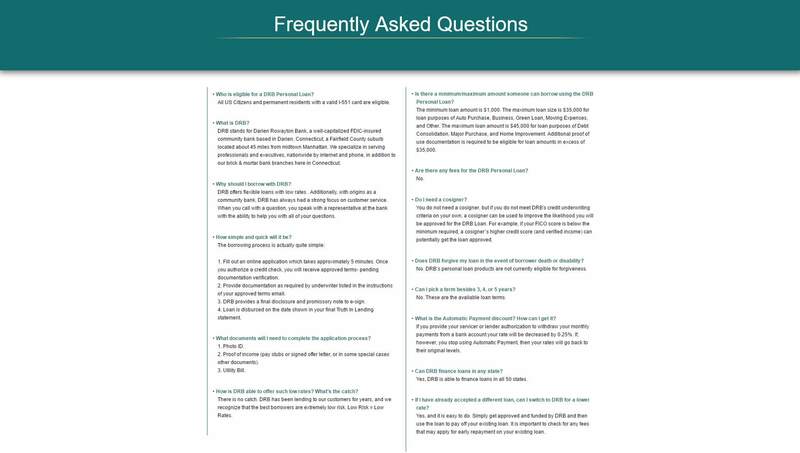 An easy and concise application process means it is easier to receive the funding you need, and DRB requires only minimal documentation to approve your loan. We were very excited by the company’s overall personal loans service, but also impressed with the fact that it is a product that is heavily geared towards students and recent graduates who are looking to get ahead in life or embark on major projects. Overall, we were very pleased with DRB’s personal loan offerings.